Well, we’ve got the fitness part covered for sure in the O Excuses Fitness System. We’ve got you covered in terms of dietary regulations in the Simple and Effective Diet. And so, you’d think we should be all done and set – ready to go – right? While fitness and diet are of paramount importance, the fact remains that we as human beings cannot and usually do not stick to any sort of diet – unless it is a) easy to prepare and b) tastes good and c) is something you can have even on your “crave” days. Well, how many times have YOU come back from a hard, hard workout – ready to eat a cow – – or several – – and then end up looking at your “diet plan”, and end up sighing in a “resigned” sort of manner? Now don’t get me wrong. Working out hard is GOOD. Feeling hungry and being ready to eat a horse after your workout is even better. But the point is this – even the “strictest amongst us” will end up neglecting a good diet (or dietary plan) occasionally if what is being consumed isn’t tasty – – or, doesn’t fit the “feel good food” part. Let’s face it. We’d probably eat ANYTHING if we were starving, but most of us aren’t – and the last thing we want to do after a tough workout is to subsist on apples and boiled eggs (many do, but do they really WANT to)? I didn’t think so either! Healthy and delicious are NOT mutually exclusive – and here is PROOF! In the Simple and Effective Diet I outlined the dietary regulations that you need to follow in order to live a long and healthy life – without feeling “denied” in any way. I even gave you a few sample meals along with tips on how to modify said meals etc – – but what I did NOT do in that book is give you actual RECIPES. THIS book rectifies that. I’m giving you 15 wonderful, time tested – and DELICIOUS recipes that you CAN eat on a regular basis – – without putting on a lick of weight if you work out alongside – – and if you keep things in moderation, of course. These recipes do not take forever to prepare. These recipes can be prepared by the average Joe in a jiffy. And best of all, they taste WONDERFUL – – you’ll never ever feel “denied” once you start eating like this! And it’s not just recipes – the real kicker to all this is what I tell you AFTER the section that has the recipes – that being the recipe for the “dips” that I give you. And no, I ain’t talking garlic butter, hot wing sauce, or even white cheese here. While all those taste great, they don’t have great effects either internally or externally. A lot of the extra lard you see hanging off people these days is not so much due to the actual food they eat – – but what they eat WITH it. They’ll order a salad – healthy and nutritious – and then drown it in a sea of unhealthy, fattening salad dressing “for the taste”. They’ll order BBQ ribs – and dump a ton of white cheese or other equally fattening condiment on it. Or … the evergreen favorite, PIZZA (and no, pizza doesn’t have to be unhealthy!) – and tons of garlic butter to boot. You get the drift, my friend. Now I don’t blame the average Joe for wanting to make their food taste great. Heck, thats why I’m giving you these recipes. I partake of such food myself on a regular basis, and haven’t put on a lick of weight as you can tell (despite being almost 38 at the time of writing this). And that’s why I’m giving you DIPS as well – dips that are “traditional” dips – made with ingredients easily found anywhere in the world – stuff that tastes GOOD! My wife is from India, and I’ve got a lot of knowledge in terms of these dips (and cooking in general) from her. While we’ve all heard about “butter chicken” (chicken tikka masala for you Brits, hehe) and other such tasty – yet uber-fattening – dishes, what isn’t generally associated with the Indian subcontinent is this – MEAT – and dips. But believe me, meat (and dips) done with a “subcontinental” twist can taste great – even to and ESPECIALLY for a Western palate which I’m assuming you and I have. And so, at the end of the recipes section, I’m giving you recipes for 10 different varieties of dips as well – stuff I eat almost daily if I’m in India with my family – and stuff that I pester my wife for incessantly, hehe. And given my reaction to some of these dips, I don’t quite blame my wife either for saying what she did! By the way, though the recipes and dips are all traditional and with a “twist from the subcontinent” – note that HOW you eat ’em is entirely up to you. No banana leaves, or “gravy fingers” for this cat, hehe. I prefer my stuff with a fork and knife as most of you do, and thats precisely the sort of recipes I’m giving you. No gravy, no lard inducing “curry chicken” or “chicken tikka masala” or other nonsense. No”chai” (milk tea) either, though many of you will probably enjoy that. Healthy stuff that you can eat daily provided you’re working out hard – and dips to taste as well! 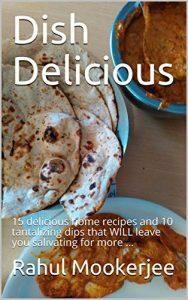 As mentioned first, 15 delicious recipes with a subcontinental “twist” as well as 10 dips along the same lines! You’re getting recipes that do NOT take forever to make (for the most part) – and recipes that are HEALTHY. Spicy and exotic recipes for “dips” – that you CANNOT find elsewhere on the Internet. A wide variety of dishes – from salad – to tortillas – and even the humble “pizza” … And NO, eating pizza doesnt have to be an unhealthy endeavor either! Well, my friend – – I’d go on and on and on AND on – but I’m getting so darn hungry after WRITING this that I’ll stop here. I’ll also call the local butcher – and perhaps order a leg – or two of MEAT! Dive right in – and be prepared to be “gobsmacked” after you taste some of this!